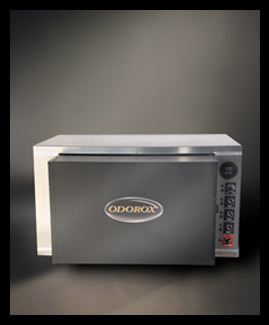 The Odorox® MVP (Master VOC Processor) product line is the smaller version of the most technically sophisticated and advanced industrial foul-air management system in the world. MVP14™ units whether in single or multiple formations are capable of working in much larger spaces than all other models except the even larger MV48 models and rapidly breaking down massive amounts of toxic odours, many types of pollutants and VOCs (Volatile Organic Compounds) while simultaneously destroying a long list of biological pathogens. 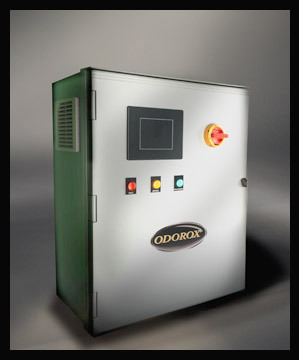 The MVP™ unit is specifically designed for single or multiple unit use in heavy duty air processing for small to medium operations such as confined feeding operations - pig and chicken farms, warehouses, manufacturing sites, food processing, paper mills, chemical plants, waste water treatment facilities, refuse transfer sites, rendering plants and many other industrial and commercial uses. Odorox®, MVP14™ and HGI Industries Inc. are either registered trademarks or trademarks of HGI Industries Inc. of Boynton Beach, Florida USA. Other trademarks are pending in the U.S. and other countries.